It has also been shown to increase natural levels of Growth Hormones and increase the body’s ability to consume and utilize oxygen, primarily due to its ability to increase levels of NITRIC OXIDE [increase VASODILATION]. 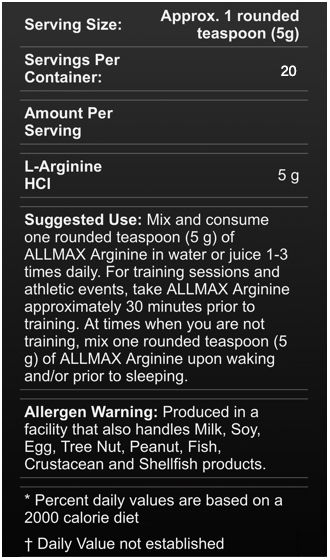 Taste Tip: Add a non-sugar sweetener and lemon juice with water to 5g of ALLMAX ARGININE. 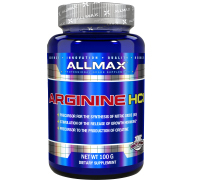 To increase the benefit of other supplements, ALLMAX ARGININE can be mixed into Protein Shakes and Creatine delivery drinks such as ALLMAX KRUSH4™ and ALLMAX ISOFLEX™.